After doing the glass gem Christmas tree, I thought this would be fun too! 1. Take two popsicle sticks and make a cross and glue together where they meet. 2. Take the other two popsicles sticks and do the same. 3. Now take both of the crosses and glue them together, so none of the arms cover the others. 4. Once glue is dry or cool, paint it white. 5. Now glue the gems onto the arms. 6. 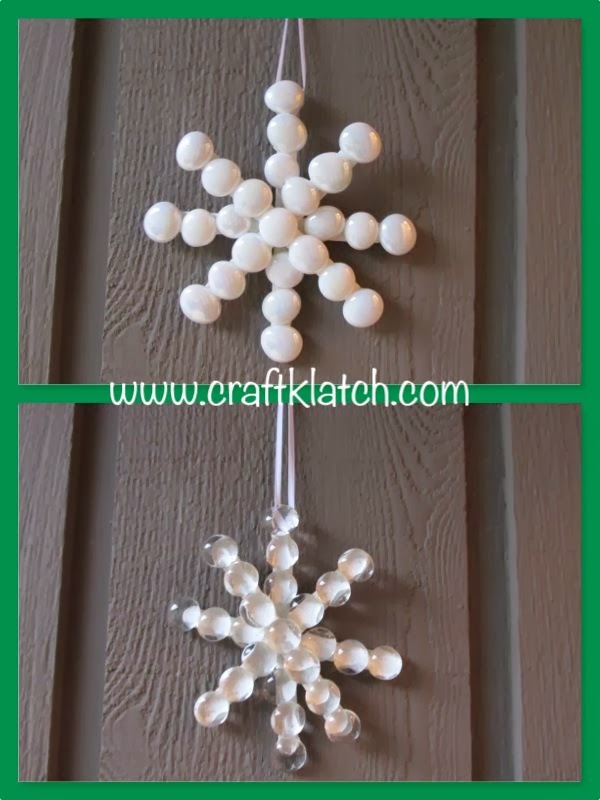 Glue a loop of ribbon onto the back of a gem or end of a popsicle stick. Once everything is cool/dry, you can hang your new ornament. There are perfect to hang on a wall because they are flat in back. If kids are making them, they can put their name and year they made it on the back. Thanks for stopping by! Happy Holidays and Happy Crafting! Whatcha Been Doin' Wednesday Coaster Palooza!